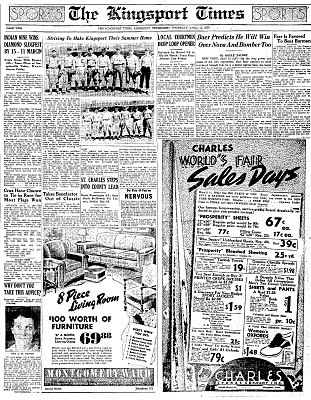 Click here to view Charlie's minor league playing record. 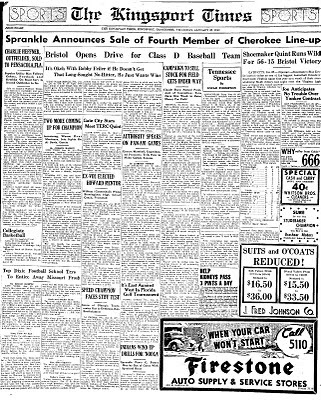 This is the first mention of Charlie in the Kingsport Times. He had just arrived from Pennsylvania to play for our Class D minor league baseball team. After a successful season, Charlie was sold to Pensacola of the Florida State League. "Heffner, whose short, stubby stature would never mark him as an outfielder, made two of the most breath-taking catches last night it has ever been this writer's privilege to see. They were such as to leave the spectators momentarily stunned when they finally realized that he actually had the ball. He raced 30 yards into right field to make the first one, a onehanded stab that nobody thought he had until he hurled it down to second base as he cut back on the dead run. The second came a few innings later when he raced again about 20 yards out of position to pick one up off the top of the grass on the dead run. Again, without stopping, he let fly, dead to the pin, at first base to catch the runner before he had time to get back and tag up for a double out. 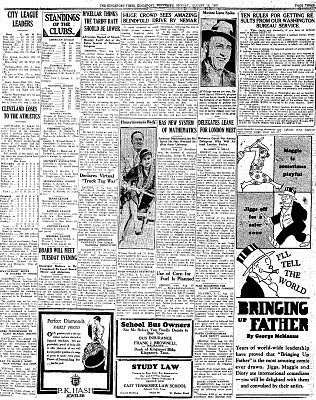 That comprised two of the most sensational catches that Kingsport Cherokee fans will see here this season, and makes us wonder again why the little Pennsylvanian didn't stick with Pensacola in his tryout." 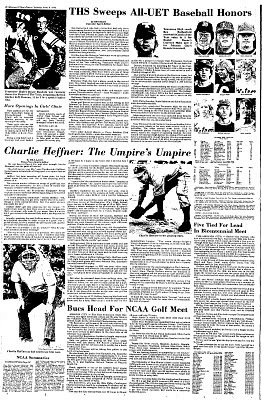 By 1976 Charlie was the dean of local umpires and was profiled by Bill Lane. 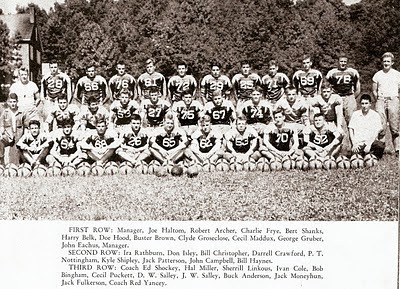 D-B's 1945 team went undefeated and untied. You can watch film from the game against Knoxville High here. 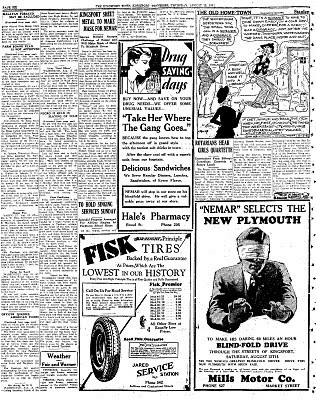 Below is the newspaper story about the game. 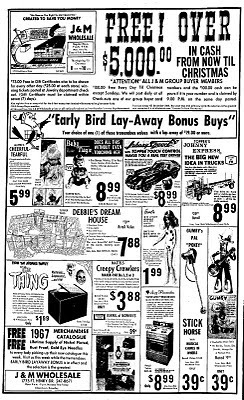 The Gumby bendable figure was hot Christmas 1966, witness this ad from J&M Wholesale. 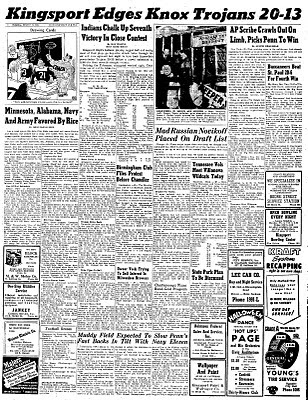 I've been searching for years for photos of Elvis performing at Kingsport's Civic Auditorium in September 1955 to no avail. The best I can do is direct you to the best website for early Elvis photos and stories, scottymoore.net, where there are pictures of Elvis from Cleveland three weeks after he appeared in Kingsport. Click here for the link to the Cleveland photos. Click here to see a silent home movie of Elvis, Scotty and bassist Bill Black performing in Lubbock, Texas in 1955. Below are two screen shots from that video, Elvis performing and Elvis and Scotty clowning around.